MAN Alpha AT3000 propulsion-control systems. The vessels will be constructed at CNN LaNaval Shipyard in Sestao, Spain with delivery dates scheduled for 2017. The order is part of Van Oord’s continuous investment programme. 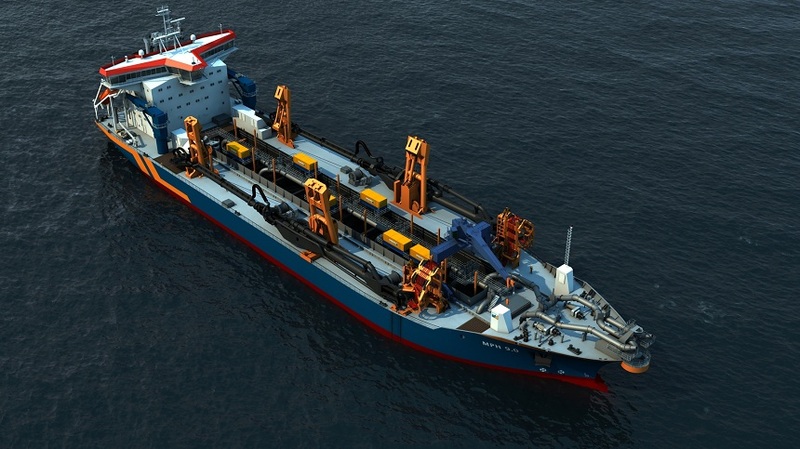 The new dredgers will have a hopper capacity of approximately 17,000 m3, a length of 158 metres and a width of 36 metres. They will also be equipped with two suction pipes with submerged e-driven dredge pumps, two shore-discharge dredge pumps, six bottom doors and a total installed power of 23,680 kW. The newbuildings will each have accommodation for 38 persons. Special attention was paid to the energy-efficiency of the vessels. The design includes several aspects which result in substantial reductions in fuel consumption and consequently a fall in CO2 emissions. The vessels will be equipped with innovative and sustainable systems and will both obtain a Green Passport and Clean Ship Notation. The 48/60CR engine type is one of the most successful engine types used in dredging application. Currently, MAN Diesel & Turbo has 14 such engines on order for installation aboard cutter- and hopper-dredger newbuildings for customers in Benelux and China. All engines will be built at MAN’s main facility in Augsburg, Germany. electronic hardware and software for engine control, monitoring and diagnosis, SaCoSone and CoCoS EDS. The MAN Alpha propeller and aft-ship package supply for each Van Oord vessel consists of a complete twin-screw propeller, nozzle and shaft system, including Alphatronic 3000 propulsion controls. The CP propellers are driven via shaft lines. Each shaft includes a disc brake and locking system. The ducted propellers are headbox-mounted AHT nozzles. A high degree of service friendliness is ensured since the propeller-hub mechanism can be inspected and dismantled from aft. Additionally, by means of intermediate plates between propeller blade flanges and propeller blades, the propeller blades are predisposed to underwater replacement – avoiding the need for docking – should such a scenario arise. The twin-screw Alphatronic 3000 system will control the two propulsion lines with engine, reduction gear and CP propeller via main-bridge control stations, engine-room control stations and an interface to joystick control for dynamic-positioning requirements.